Malignant otitis externa or skull base osteomyelitis is a potentially life-threatening infection. It originates in ear canal with progressive spreading along the soft tissue and bone of skull base, ultimately involving intracranial structures. It is a rare disorder usually occurring in elderly patients with diabetes or immunosupression, as suggested by Hariga and other et al. , It has also been reported in immunocompetent patients. The most common causative agents are Pseudomonas aeruginosa. However other bacteria, e.g., Staphylococcus aureus and Klebsiella pneumonia, have rarely been implicated. Other very rare cause which has not been previously reported is actinomycosis. The most common presenting symptoms are otolgia and otorrhea, as suggested by Blanchet et al. The hallmark finding is granulation tissue at the bony-cartilaginous junction. Initially infection is confined to the ear canal, but as it progresses, it involves the facial nerve followed by lower cranial nerves (IX, X, XI, XII), as suggested by Mani et al. The work-up includes computed tomography, technetium, and gallium bone scan to follow course under treatment. , Treatment is mainly medical with antipseudomonal drugs such as fluoroquinolone. Surgery should be left for extensive and refractory cases. Actinomycosis is a subacute-to-chronic bacterial infection caused by filamentous, gram-positive, non-acid-fast, anaerobic-to-microaerophilic bacteria. It is commensal saprophyte often found in oral mucosa, teeth cavities, and tonsils, as suggested by Murat et al. Diagnosis is often made by histopathology which shows filamentous rods with sulfur granules. Treatment is initially with IV penicillin for 3-6 weeks followed by oral penicillin for 3-6 months. A 55-year-old male with known case of diabetes mellitus, hypertension, and end-stage renal disease presented to the emergency room with pain in the left ear, ear discharge, and headache for the past 8 months. The ear pain increased with left facial weakness for the past 1 week. No other relevant significant history was documented. Granulation tissue in left ear canal, with mucoid discharge and edematous canal were evident on ear examination. Grade V left facial weakness as per house Brakman classification was clear from his face. Diagnosis is made on the admit ion of patient as left malignant otitis externa. Intravenous fluoroquinolone was started. 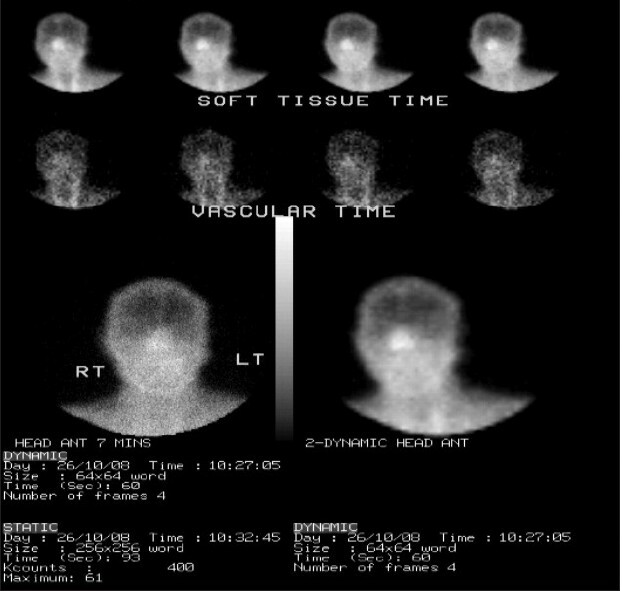 Reviewing his CT scan and bone scanning showed temporal bone involvement and increased radionuclide uptake, [Figure 1] and [Figure 2]. Left canal wall down mastoidectomy and debridement of surrounding tissue were performed as the patient did not improve on conservative management. Surprisingly, yellowish material with thick fibrous cord was found in mastoid cavity extended from the posterior canal wall to the sigmoid plate. 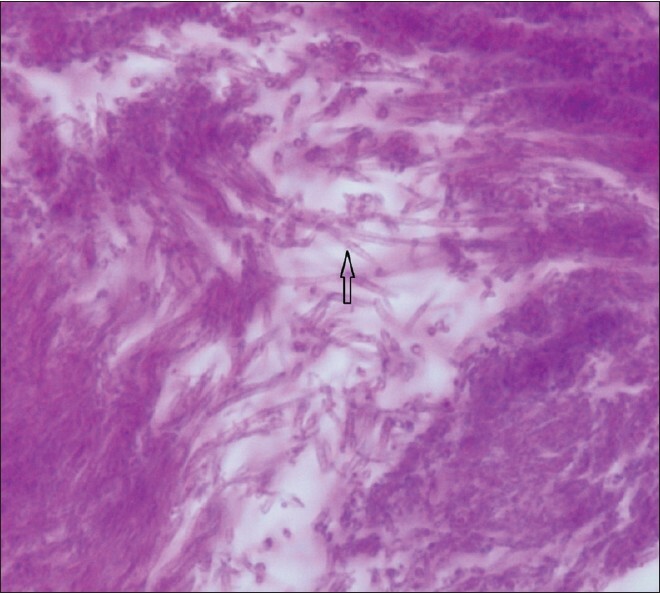 Histopathology came as filamentous branching organism consistent with actinomycosis [Figure 3]. Antibiotic was changed to intravenous amoxicillin clavulanate and continued for 4 weeks. The patient then improved and was discharged on oral amoxicillin clavulanate for 3 months. Patient was followed up in the clinic for 2 years with no recurrence with improvement of facial palsy to grade II-III. Malignant otitis externa is an uncommon infection of the ear canal and temporal bone with potential serious complications. It is commonly caused by P. aeruginosa. In our presented case, the organism was actinomycosis. From literature review, this is the first case to be reported due to actinomycosis. 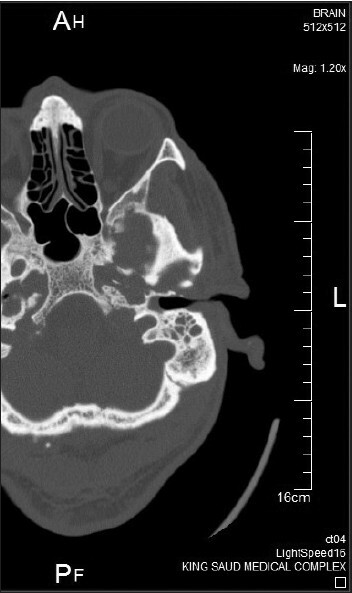 In the present case, patient had a history of left ear discharge with pain which was followed by facial weakness. In addition, patient was a known diabetic, hypertensive, and with renal failure. Left temporal bone involvement with positive bone scan necessitates diagnosis of malignant otitis externa. IV antibiotic treatment with intravenous fluoroquinolone started for 1 week blindly with renal adjustment dose. Cultures seem not of a good help as we sent swab two times, but all came negative. Also, the improvement on only medical treatment was slow and unremarkable. Early canal wall down mastoidectomy with debridement seems to improve his symptoms dramatically. We think changing the antibiotic to IV amoxicillin clavulanate for 4 weeks is the best management and to reserve ciprofloxacillin for the resistant pseudomonal infection. Improvement of the patient was noticed on both clinically (mainly on pain) and on his systemic illness the diabetes and his high blood pressure where it was easily got under control. Oral augmentin for 3 months is advised for actinomycosis. Actinomycosis should be kept in mind for patients with malignant otitis externa, although it is very rare. Cultures, as in our presented case, are usually unhelpful in diagnosis. Surgery plays an important role for diagnosis and treatment of actinomycosis and to control his systemic illness. Dr. Habib Hasan, Nuclear Medicine Radiologist Department, King Saud Medical City. Dr. Osman Ahmed, Histopathologist, Histopath Department, in King Saud Medical City. 1. Hariga I, Mardassi A, Belhaj Younes F, Ben Amor M, Zribi S, Ben Gamra O, et al. Necrotizing otitis externa: 19 cases report. Eur Arch Otorhinolaryngol 2010;267:1193-8. 2. Glynn F, Walsh RM. Necrotizing otitis externa: A new trend? Report of 6 atypical cases. Ear Nose Throat J 2009;88:1261-3. 3. Franco-Vidal V, Blanchet H, Bebear C, Dutronc H, Darrouzet V. Necrotizing external otitis: A report of 46 cases. Otol Neurotol 2007;28:771-3. 4. Mani N, Sudhoff H, Rajagopal S, Moffat D, Axon PR. Cranial nerve involvement in malignant external otitis: Implication for clinical outcome. Laryngoscope 2007;117:907-10. 5. Enoz M. Actinomycosis of the tongue. Int J Infect Dis 2007:7.